Actor Zak Efron is the latest in the list of celebrities creating their own personal YouTube channels. The star, known for his performances in 'High School Musical' and 'The Greatest Showman' posted his first video on YouTube titled “We Spent 96 Hours In The Desert”, which was filmed with his brother Dylan. Efron announced the opening of his channel on his official Twitter page. 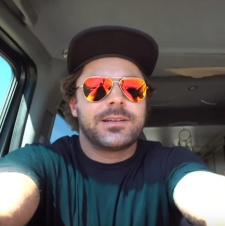 The video he posted is part of a series called “Off the Grid”, where Efron travels to various locations and experience things together that are out of his usual comfort zone. The first video features Efron and his brother visiting Lake Mohave. The two of them sleep outdoors, water ski, go hiking, and much more. He also promises other locations will be highlighted in the series, which will include even more adventures with him and his brother. As of writing, the channel has racked up over 445k subscribers, and the debut vlog has over 1.1 million views. The channel has been active since January 2014 but any other existing content has been hidden or removed.